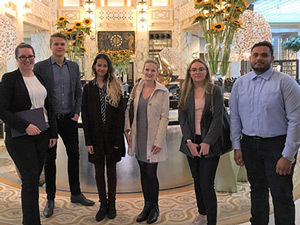 Students at Wittenborg Vienna headed for a posh 5-star hotel, the Park Hyatt Vienna, for their first Project Week activity. The group was led by the director of Wittenborg Vienna, Dr Alexander Bauer and Luise Wagner, the project week lecturer in Vienna. Now more than 100 years old, the Park Hyatt building served for 92 years as one of Vienna’s grandest banks, situated in the heart of the city, before opening its doors as a hotel in 2008. Students were able to take in one of its most famous attractions - a gold-lined pool, located in the former bank vault. They were also extensively informed about the business by the CTR manager of career options at the hotel. Bauer said students were expected to do a price analysis of the Park Hyatt as a 5-star accommodation, and also compare it with other 5-star hotels in the world. 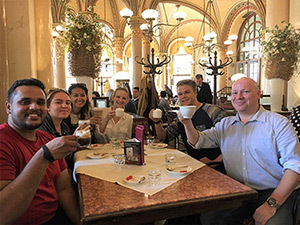 Before visiting the hotel, the group toasted Wittenborg on its 30th anniversary from a typical Viennese café.